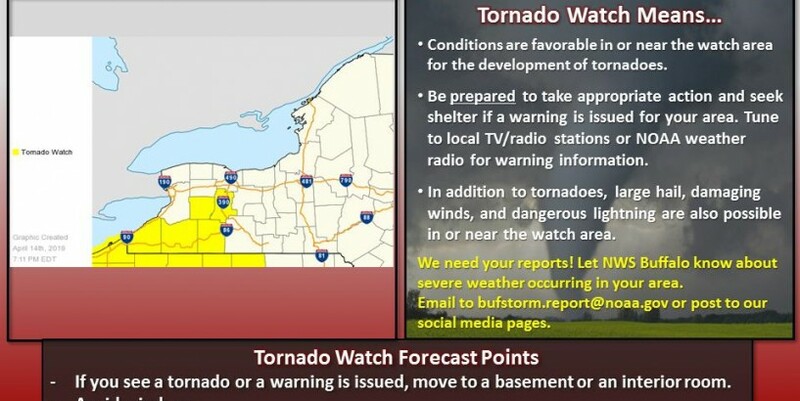 Tornado watch remains in effect for parts of Western New York until 3 a.m. The National Weather Service has canceled its tornado watch for Chautauqua and Cattaraugus counties, but it remains in effect until 3 a.m. Monday for Allegany, Wyoming and Livingston counties and until 5 a.m. for the Finger Lakes and most of Central New York. The weather service says a watch indicates conditions are "favorable in or near the watch area for the development of tornadoes." Large hail, damaging winds and lightning are also possible in or near the watch area. The weather service says if you see a tornado, or if the watch is changed to a warning, move to a basement or interior room, and avoid windows. Severe thunderstorm warnings also were issued for mid-evening in Chautauqua County, Cattaraugus County and the southern half of Erie County. As the storm moves eastward, other warnings were posted for Allegany County, Wyoming County and Livingston County. At 11 p.m., National Grid reported nearly 5,900 customers had lost power in Cattaraugus County, primarily in northeastern portion of the county. Most heavily affected were Delevan, Machias, Lime Lake, Freedom and Franklinville.